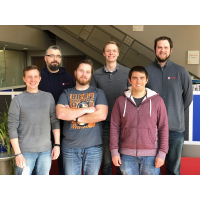 Allendale, MI, March 27, 2018 -- BizStream, a web and software development shop located near Grand Rapids, MI is proud to announce the addition of 6 new team members. BizStream has brought on the new hires to support project and product growth. Pictured Left to right, top to bottom: Jordan Whiteley, Ben Buurstra, Caleb Compston, Darian Bonnell, Nathan Graham, and Mike Webb. Whiteley, Buurstra, Webb, and Graham will join the company’s team of developers in the development of a variety of client-based projects and BizStream-built products. Compston will collaborate with the existing Project Managment team to oversee organization of client projects. Bonnell will assist in creating approaches for software design and implementation to guide the development team as Solution Architect. “Attracting talent in the technology industry can be really competitive,” notes BizStream Founder, Mark Schmidt. “I think people are excited to join BizStream because we have an extremely talented team that works hard to create awesome stuff, and we have a lot of fun doing it.” Schmidt goes on to say that the company’s unique culture and modern workspace also help to intrigue applicants. Two more full-time hires are expected to join BizStream this spring. BizStream builds web, online marketing, and software solutions. The company specializes in ASP.NET, SQL Server, and Kentico CMS and Kentico EMS development. Alongside custom development services, BizStream has three Software as a Service (SaaS) products including YouthCenter, CaseStream, and Toolkit for Kentico. Founded in 2001, the BizStream team comprises more than 25 developers, designers, digital specialists, support staff, and contractors. BizStream is located just outside Grand Rapids, MI.